One and only solo album from 1971 of former lead singer of Affinity. Remastered with unseen photos from Linda’s personal album and notes by Linda and Mo Foster, on vinyl this album changes hands at a cool £150 a copy! The all-star band features Chris Spedding, John Marshall,Karl Jenkins and Jeff Clynne most of whom were members of Ian Carr’s Nucleus. ...this prog-era curio...is sure to be favourably received by those unwilling to part with a three-figure sum for an original copy. …an 11-track set that pursues Affinity's affinity for jazz-rock and includes Hoyle's own recollections of the songs and the sessions within the accompanying booklet. 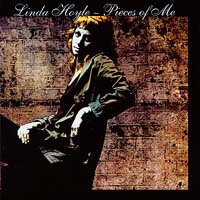 Hoyle and writing partner Jenkins(keys) crafted impressive, progressive rock/jazz numbers of considerable power and nuance. No wonder the vinyl of this is/was so collectable, it's bloody good. …music that was ambitious and personal, rather than calculated to appeal to the masses. Hoyle sings impressively…Jenkins' arrangements are imaginative and satisfying. Spedding's vicious, menacing solo on Nina Simone's 'Backlash Blues' is outstanding.